Junior golf coaching for the mental game may be the most complicated because of the many variables at play with this age group. A proper perspective about life that includes golf, but does not make it the defining criteria for one’s self-worth and value, is imperative for great golf performance and a happy life. Junior Golf coaching establishes a set of values, principles, and skills that apply to every aspect of life. First of all, junior golfers need to learn patience and not blow up after a bad short. Too many junior golfers take themselves out of the tournament after one bad shot –– their whole round is ruined. The ability to recover quickly is very important to successful play in competition. Secondly, junior golfers need to develop enhanced concentration skills to sustain proper focus throughout an entire round. Concentration and focus is something that can be learned, developed and enhanced. There are some very effective meditation and breathing techniques to accomplish this. This is the core information presented in my certification training program for the mental game. A great resource to help parents coach their kids. 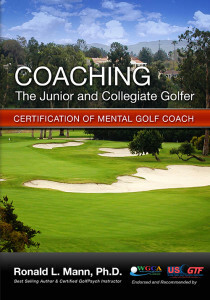 This is the core textbook for the Mental Golf Coach certification training program. It is recommended and endorsed by the United States Golf Teachers Federation. This textbook is also being used as the core material for the Coaching Certification Course offered by the Chinese Division of the United States Golf Teachers Federation. You can now get this textbook without taking the certification course and at a fraction of the cost! This is professional information that is unknown to the general public. It is now available to you. I have worked with golfers and parents of all ages. I am a certified GolfPsych Instructor and trained as a clinical psychologist and Yoga Instructor. I am an accomplished golfer and know the game. It takes a number of hours of direct coaching with me to learn the information I have presented in this book. You could easily spend over a $1,000.00 dollars of coaching time with me. Most people do not have the money to learn all that is in this book. Most parents have great intentions and are 100% committed to helping their kids play better golf. However, they do not have the training and information to help them with the most important part of the game: Mental Strength and Self-Mastery. This textbook provides in-depth and down-to-earth information and techniques about the mental game. Parents and coaches can get this information at a fraction of the cost through this textbook. This information is great to coach golfers of all ages, but it does have a specialized focus on working with younger players. Both Ellen and I are convinced the camp was helpful. Yesterday, at her League Tournament she cut 4 strokes off her average score, was best score for her team, and only 3 strokes off the leader. She was pretty happy about all that (and so was I). Keep us posted on future training opportunities. The breathing made me more consistent and trust my shotmaking. The breathing relaxed me and helped me focus. I think the benefit of this class was that it helped me to breathe and control my anger. And it helped me with my mental game and learn great yoga stretches. 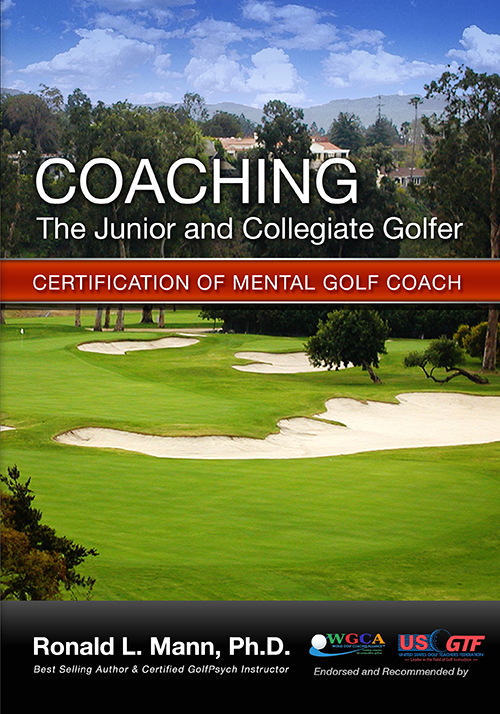 This course allowed me to excel in my mental game. I learned to breathe well and learned many yoga exercises. Slowing down my swing made me discover my own potential of accuracy. Being more balanced also helped my swing. This course taught me how to relax on the golf course. The breathing seemed to clear my mind and that is essential for being good at golf. I learned how to commit and be confident in my shot-making abilities. I feel that the breathing techniques helped me stay optimistic and sty in the present, as well as focus. The course helps you to become less mechanical and get more feel with your golf game and it convinces you to really trust yourself, your decisions and your golf swing. It was very valuable to learn how to breathe correctly and stay in the present. Please contact me if you would like to talk about creating a coaching program for your daughter or son.